Chart showing how the mass of a star and the size of its habitable zone are related. Mstar/MO is the ratio of the mass of the star to that of the Sun; the letters A, F, G, K, M refer to the spectral type of the star; AU = astronomical unit (mean distance of the Earth from the Sun); "tidal lock radius" is the distance from the central star at which a planet will have one hemisphere always facing the star. A hypothetical planet depicted moving through the habitable zone and then further out into a long, cold winter. Image credit: NASA/JPL-Caltech. The habitable zone (HZ) is an imaginary spherical shell surrounding a star throughout which the surface temperatures of any planets present might be conducive to the origin and development of life as we know it. Also referred to as the ecosphere. The single most crucial factor to the evolution of terrestrial life has been the ready availability of liquid water. Not only does water serve as the solvent for biochemical reactions but it also furnishes the hydrogen upon which living matter depends. Water will remain liquid under a pressure of 1 bar (terrestrial sea-level pressure) between 0°C and 100°C. Even on Earth, however, geographical, seasonal, and diurnal variations can cause the temperature to fall well below freezing (as low as -70°C in Antarctica), yet life can survive under these conditions. At the other end of the scale, although most terrestrial organisms cannot endure temperatures consistently above 45°C, hyperthermophiles have been found thriving around hydrothermal vents at 113°C. It's reasonable to assume that if the Earth had been marginally closer or further from the Sun, life of some kind would still have evolved on it. But the limits of the Sun's HZ are not easy to fix. The discovery of primitive life, or fossils, on Mars would extend the HZ of the Sun out to at least 225 million kilometers (140 million miles). On the other hand, the absence of martian biology would not rule out the possibility that if the Earth, with its greater mass able to retain a denser atmosphere, had orbited at the distance of Mars it would have been capable of nurturing life. Indeed, Mars itself enjoyed warmer, wetter conditions in the past under which primitive organisms may have evolved. Much further from the Sun are the gas giants and their large moons, at first sight inhospitable to life. Yet the effect of tidal heating on these worlds, resulting possibly, in cases such as Europa and Callisto, in the existence of large amounts of sub-surface liquid water, makes them biologically interesting.1 Were life to be discovered on one of Jupiter's moons, the outer margin of the Sun's HZ would be pushed out to almost 800 million km (500 million miles). Even further from the Sun, Saturn's moons Titan and Enceladus are now considered potentially life-bearing. The inner margin of the Sun's HZ is somewhat easier to define. Venus is approximately terrestrial in size, mass, and composition, but its proximity to the Sun has prevented its development from following an Earthlike course. 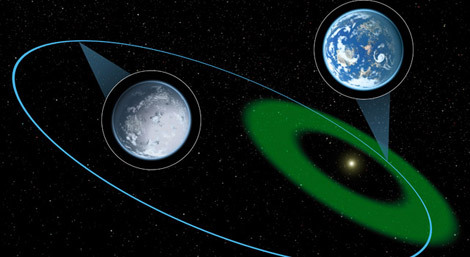 On our own planet, temperatures were low enough for most of the water vapor released in large quantities from primordial volcanoes or colliding comets to condense and form oceans of water (see oceans, origin). These oceans subsequently mopped up the bulk of the carbon dioxide also produced by volcanic activity. On Venus, however, it was too hot from the outset for the water vapor to condense. As a result, the massive amounts of carbon dioxide pumped into the primitive Venusian atmosphere remained there and served to bring about a runaway greenhouse effect. The already uncomfortably high surface temperature soared to around 460°C, at which point any kind of complex biochemistry along terrestrial lines was ruled out. Based on present knowledge, therefore, and until more is known about conditions on worlds such as Europa and Titan, we can reasonably put the extent of the Sun's HZ for an Earth-sized planet at between 120 million and 240 million km (75 million and 150 million miles) – that is, 0.8 to 1.6 times the radius of the Earth's orbit. Regarding other stars, the size and location of the HZ depends on the nature of the star in question.2, 3 In general, hot, luminous stars – those of spectral types "earlier" than that of the Sun (G3–G9, F, A, B, and O) – all have wide HZs, the inner margins of which are located relatively far out. For example, to enjoy terrestrial temperatures around Sirius (26 times more luminous than the Sun), an Earth-sized planet would have to orbit at about the distance of Jupiter from the Sun. By contrast, if the Sun were replaced by Epsilon Indi, which has only about one-tenth the Sun's luminosity, the Earth would need to be in a Mercurian orbit to receive its present level of warmth. The situation becomes even more extreme in the case of a red dwarf, such as Barnard's Star (about 2,000 times less luminous than the Sun), the HZ of which would extend only between about 750,000 and 2 million km (0.02 to 0.06 AU). Even if planets exist so close to their parent star (as now seems likely following the discovery of epistellar jovians) the development of life might be made problematic through a gravitational lock. By contrast, the HZ of a highly luminous star would in principle be very wide, its inner margin beginning perhaps several hundred million km out and stretching to a distance of a billion km or more. However, this promising scenario is spoiled by the fact that massive, bright stars are much more short-lived than their smaller, dimmer cousins. In the case of the giant O stars and B stars, these very massive objects race through their life-cycles in only a few tens of millions of years – too quickly to allow even primitive life-forms to emerge. Given the rate of evolution of life on Earth, it is possible that microorganisms might have time to develop on worlds around A stars (see stars, lifetimes). But in the search for extraterrestrial intelligence, the HZs around F stars and later must be considered the most likely places to look (see Sunlike stars; target stars). Among exoplanets discovered to date, a number move within their stars' habitable zones. A website – www.hzgallery.org – has been set up which keeps track of known planets whose orbits keep them within the HZs of their home star at least part of the time. A surprising number of exoplanets move in orbits that have a high eccentricity – in other words, are very stretched out. Such a planet might only spend a small amount of time each orbit within the habitable zone. The rest of the time it is much further away from its central so that its surface temperatures may be far below the freezing point of water. Conditions on such a world might not suit higher plants and animals of the type we're familiar with here on Earth. But there are many simpler kinds of organism, including bacteria and various types of extremophile, which can survive for long periods in a dormant state and then revive during brief spells when conditions are more clement. In the case of Vega, Lstar/Lsun = 53, which gives a range for HZ of 5.1 to 10.9 AU. In the case of Kapteyn's Star, Lstar/Lsun = 0.004 and the corresponding HZ range is 0.044 to 0.095 AU. 1. Reynolds, R. T., McKay, C. P., and Kasting, J. F. "Europa, Tidally Heated Oceans, and Habitable Zones Around Giant Planets," Advances in Space Research, 7 (5), 125 (1987). 2. Hart, M. "Habitable Zones Around Main Sequence Stars," Icarus, 37, 351 (1979). 3. Kasting, J. F., Whitmire, D. P., and Reynolds, R. T. "Habitable Zones Around Main Sequence Stars," Icarus, 101, 108 (1993). 4. Doyle, L. R., ed. Circumstellar Habitable Zones, Proceedings of the First International Conference on Habitable Zones, San Francisco, Menlo Park, Calif.: Travis House (1996). 5. Balázs, Béla A. "SETI and the Galactic Belt of Intelligent Life," a paper presented at Bioastronomy 99: A New Era in Bioastronomy, Kohala Coast, Hawaii, August 2-7, 1999.